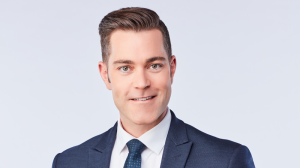 Scott Roberts is the CTV News at Six co-anchor alongside Mi-Jung Lee. Scott is a multiple award-winning journalist who joined the CTV Vancouver newsroom in April 2012. Since then, he’s travelled throughout the province to cover some of the most high-profile stories in B.C. He was in Tofino when a whale watching vessel capsized in 2015, killing six people. His coverage earned an award from the Radio Television Digital News Association. In summer 2017, as wildfires raged in several B.C. communities, Scott and Mi-Jung co-anchored comprehensive coverage that earned the CTV News team the award for best newscast in B.C., as well as the prestigious Edward R. Murrow Award for best breaking news. Scott is also a three-time Jack Webster Award nominee, and one-time winner. He was nominated for a special series on pipeline concerns, travelling to Battle Creek, Michigan to investigate an Enbridge oil spill and how it could affect a pipeline proposal in B.C. He was also nominated for a CTV News exclusive on animal abuse uncovered by hidden camera footage at dairy farms in the Fraser Valley, which earned him an Edward R. Murrow Award. And he won a Jack Webster Award as part of the news team that investigated the murder of 17-year-old Serena Vermeersch, uncovering information that her killer should never have been released from jail. Scott has also covered politics extensively, traveling across the province with both the John Horgan and Christy Clark campaigns in the 2017 B.C. election. On election night, he delivered live reports from the floor of the NDP headquarters in the most nail-biting finish in modern history. The broadcast was honoured with the RTDNA award for best live special. Scott was also on Vancouver Island to cover the 2015 federal election and traveled to Seattle to cover the 2016 U.S. election for CTV National News. Prior to joining CTV Vancouver, Scott was an anchor / reporter at CTV Edmonton, part of the team honoured with RTNDA awards for best newscast and best continuing coverage of the Slave Lake wildfires. He also covered provincial politics extensively, including one-on-one specials with both sitting premiers during his time in Alberta. As a graduate of Ryerson University’s School of Journalism in Toronto, Scott’s professional life began as a print journalist at The Toronto Star. Moving on from there, he wrote for The Globe and Mail covering high profile stories like the Toronto 17 terrorism investigation, and the Air France crash at Pearson International Airport. Born and raised in Dresden, Ontario, Scott grew up in a horse racing community and still enjoys watching the sport. He's an avid runner and takes full advantage of outdoor life in Vancouver.